My husband's birthday falls, rather inconveniently, 4 days before Christmas. This always presents problems with restaurants serving festive dishes, bars crowded with Christmas parties and friends too busy to celebrate. So when it came to celebrating Simon's "big 4-0" I knew I'd have to do something pretty great to compete with Christmas. I didn't want his birthday to get lost in Santas and reindeers, it's not every day you turn 40! 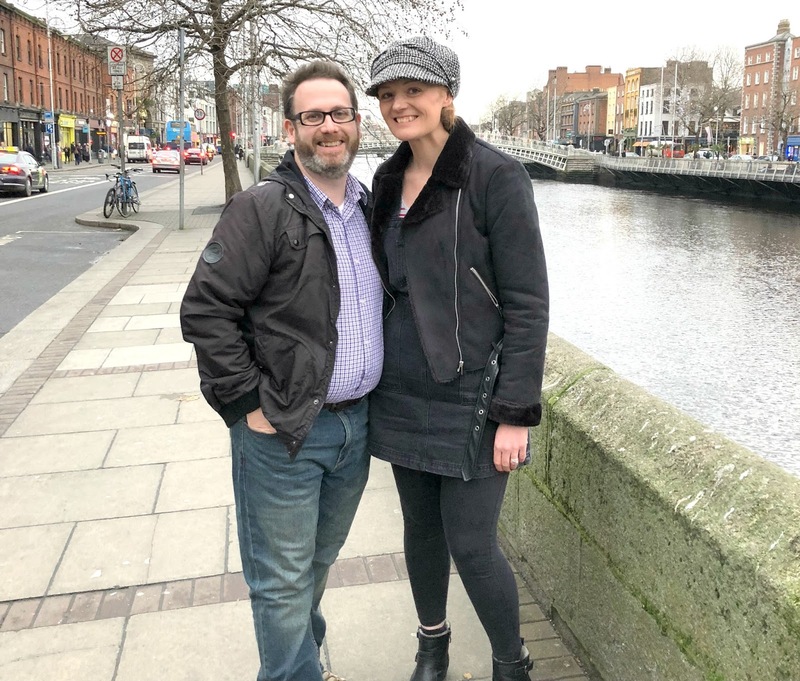 I decided to surprise him with a trip to Dublin, somewhere we've always talked about visiting together and a city that's important to Simon as his late Dad was born there. It felt like the perfect place to celebrate a special birthday. Destination decided, I started planning our trip in the Summer, told everyone we knew about it (me and my big mouth!) and then had to swear them all to secrecy so that he wouldn't find out. Don't ask me how I did it but I somehow managed to get Simon all the way to Newcastle Airport before revealing our plans. He was very surprised! 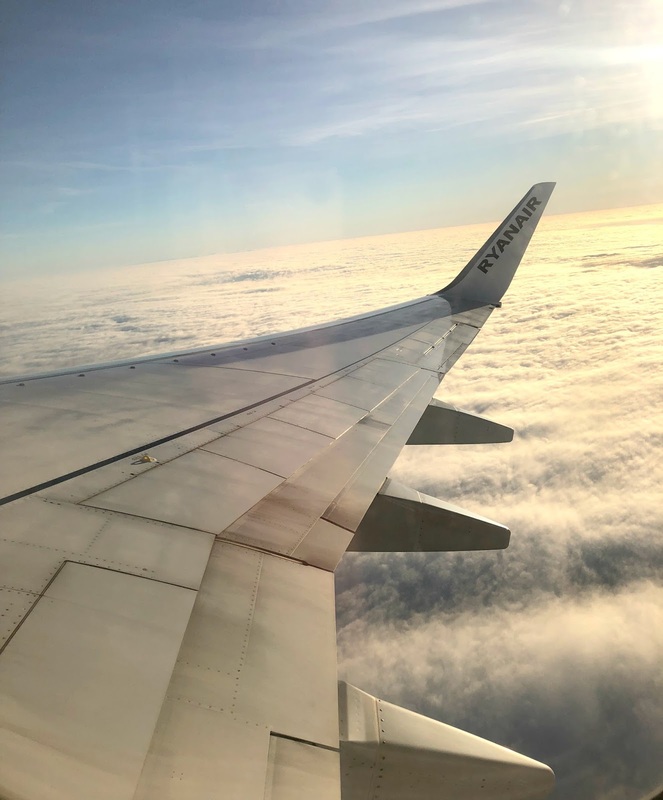 Dublin is a short flight from Newcastle Airport with a couple of flights a day leaving the North East to make the 50 minute trip over the Irish Sea. 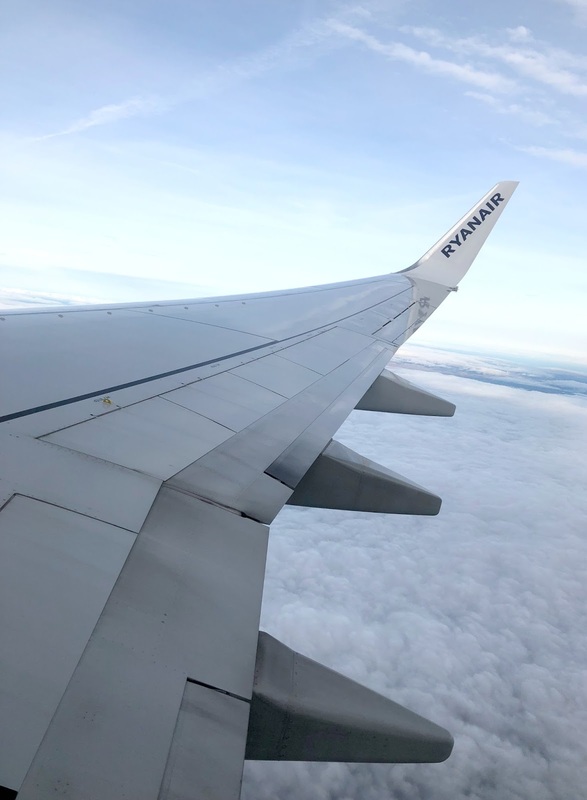 We managed to travel with small cabin bags making it a pretty effortless weekend trip, if you've not been before I'd recommend planning a trip! As you can imagine hotels in Dublin at Christmas time didn't come cheap and finding somewhere that looked nice, was in a good location and wasn't going to bankrupt me for a three night stay was pretty tricky. 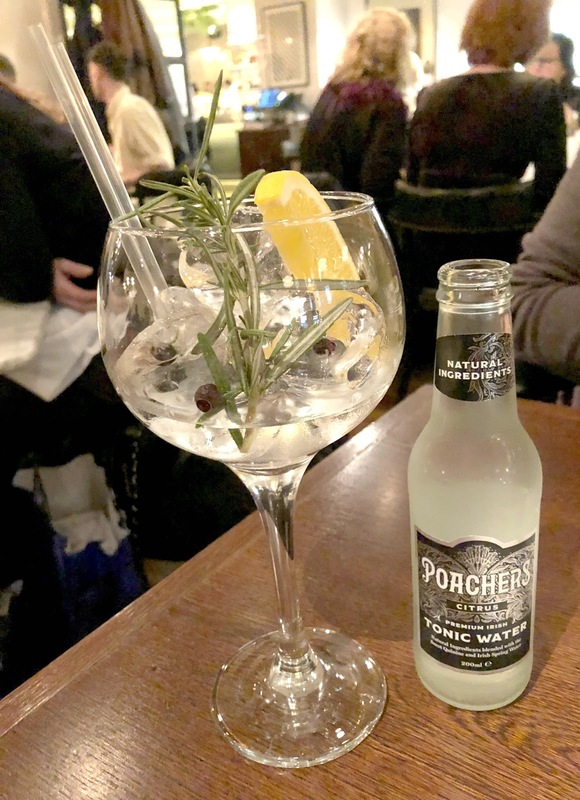 I spent hours researching before stumbling across Brooks Hotel on Drury Street, a very short stroll from the shops of Grafton Street and pubs of Temple Bar. I booked direct through the hotel and mentioned on my booking that it was Simon's 40th so we were really happy when we arrived to discover that, despite the hotel being very busy for Christmas, they'd very kindly upgraded us to a Junior Suite. We really enjoyed having the extra space - a good bedroom to rest your weary legs when you're on a city break is a must! 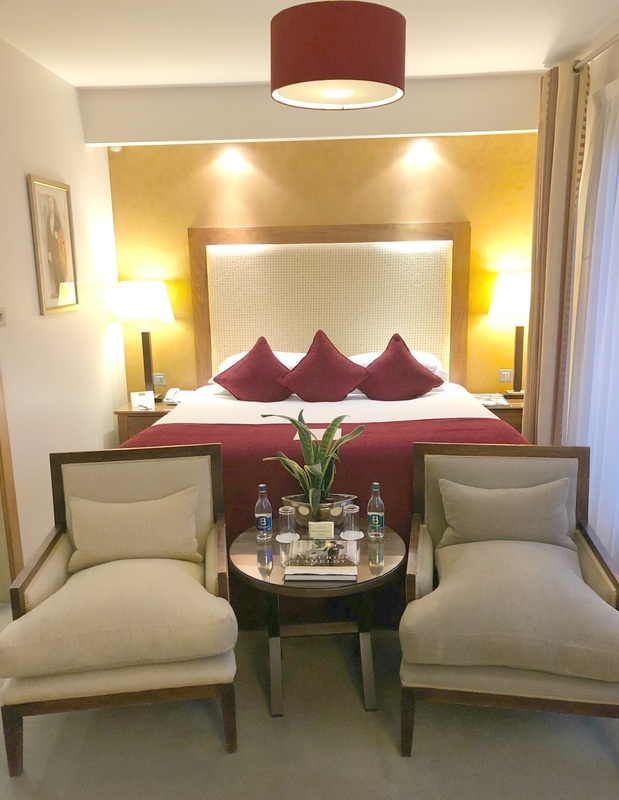 We were very impressed with the lovely little touches that made the hotel really comfortable including a pillow menu, turndown service (Simon loved that he managed to catch the "chocolate man" a few times and got some extra choccies for our pillows! ), concierge, White Company toiletries, a secret resident only lounge and the all important super fast wifi. The noise from the outside street during the early part of the night was a little loud, but it wasn't really surprising considering it was a few days before Christmas and people were out celebrating. It didn't stop us getting some shut eye, but if you're considering the hotel for a break and want some peace and quiet it may be worth requesting a room away from the street. Breakfast wasn't included in our rate at the Brooks Hotel and although we could have added it, the brunch spots in Dublin were too good to resist. I did a geeky amount of research before our visit (we're talking literally hours!) and carefully selected a few places to try. The Bakehouse - The Bakehouse, a cute little bakery and eatery close to the banks of the River Liffey that served up a might fine breakfast. Simon went for the Sausage Sandwich and I couldn't resist the Bakehouse Pancakes served with banana, blueberries and maple syrup. Sophie's at the Dean - we spent quite a bit of our weekend nosing at other hotels that we weren't staying at. Does anyone else do that? I love popping into hotels to check out their bar and try out their restaurants. The Dean has to be the coolest (most instagram perfect!) 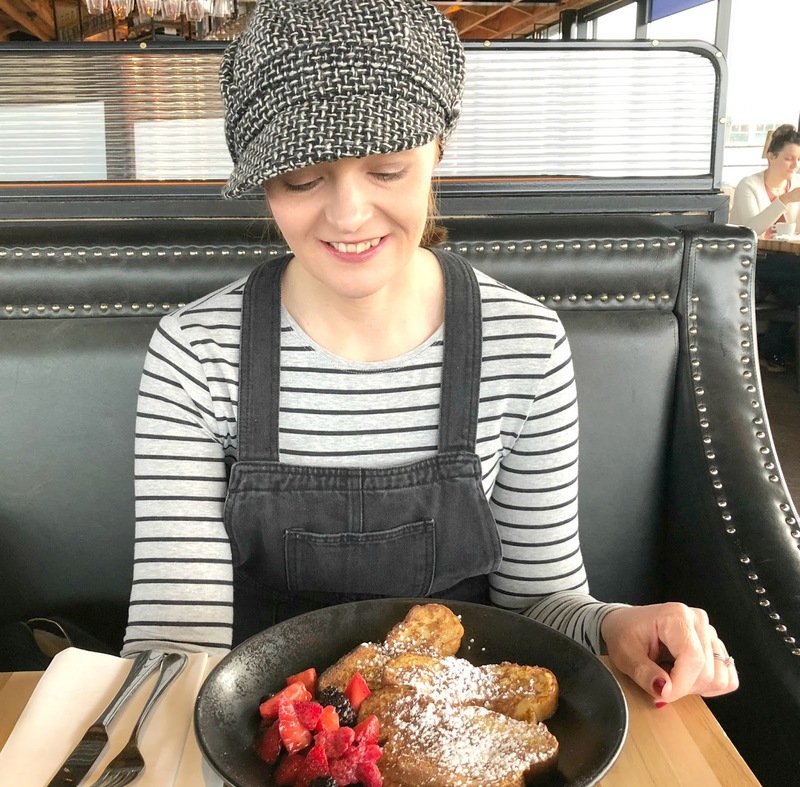 hotel in Dublin and we couldn't resist trying out Sophie's, their rooftop restaurant offers 360 degree views of the city, adult sized swings in the lobby and has a great breakfast menu. 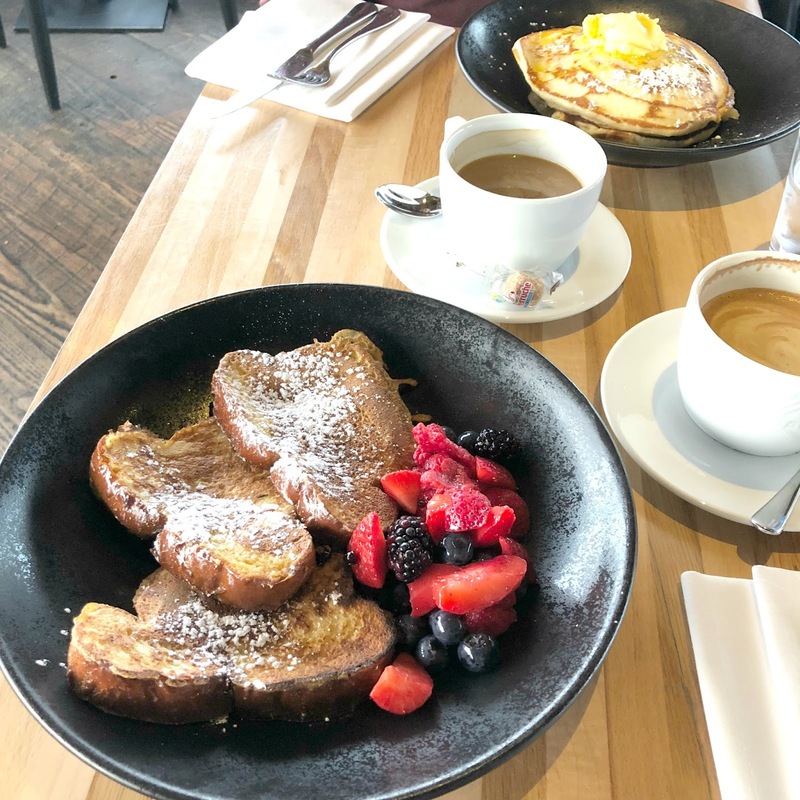 I enjoyed French Toast with Maple Syrup and Fresh Berries which would have been the most amazing brunch I'd ever had, if my fork hadn't also attacked Simon's food. 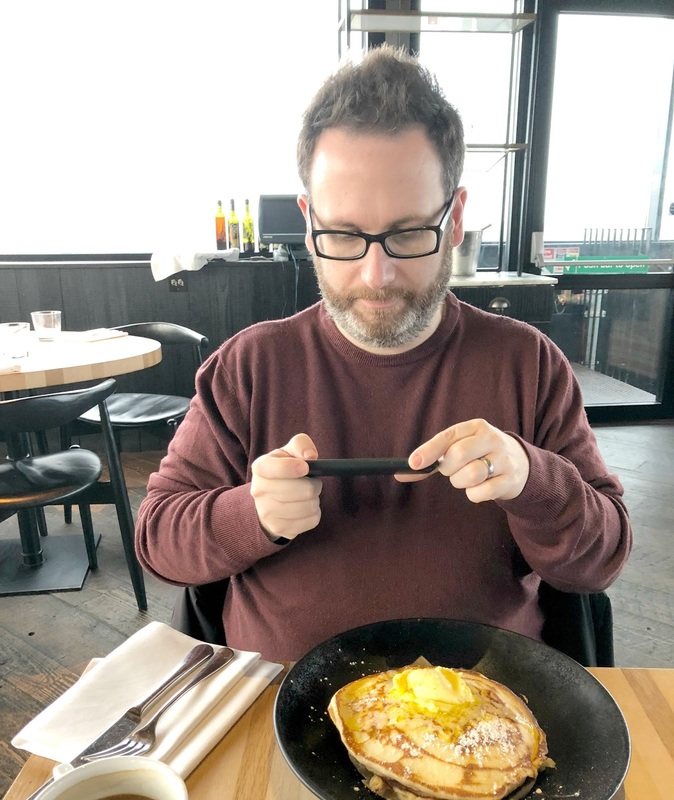 His Blueberry Pancake Stack with Maple Syrup and Orange Butter was out of this world. How come I've never tried Orange Butter before? It is so good! Luckily his portion was so huge he couldn't manage it all so I polished his breakfast off after finishing mine. Greedy? Yes! Regrets? None! Shopping in Dublin was pretty crazy in the run up to Christmas, shops were open until late and the streets were rammed with people trying to pick up last minute presents. 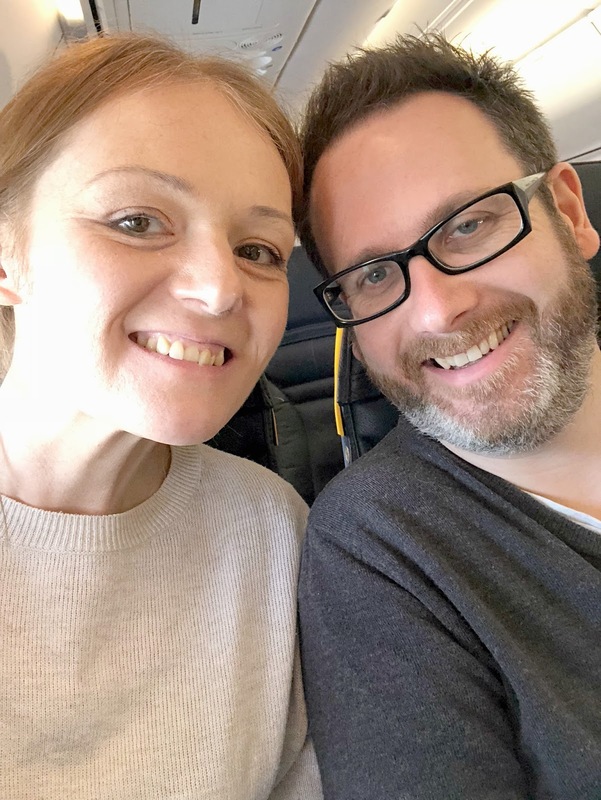 We managed a bit of a potter before having to call it quits but the small amount that we saw definitely made us want to return, Dublin is a great shopping destination. We spent most of our time on the tourist hotspot, Grafton Street which is lined with the most popular stores including a very large Ted Baker, And Other Stories and, of course, Brown Thomas - the city's most beautiful department store. I spent a little longer than I'd like to admit wandering the beauty hall, lusting after designer bags and trying on sunglasses before my husband managed to drag me out the door before I could reach for the credit card. For more boutique type shops The Powerscourt Centre was beautiful for a wander, housed in a beautiful Georgian building it's a treasure trove of antique shops, jewellery stores and clothing boutiques with plenty of great looking places to eat. If, like me, you are a huge fan of Primark you'll be pleased to know that the bargain store was actually born in Dublin under the name Penneys and you'll find a store so large it'll make your jaw drop on Parnell Street. I planned a quick walk around but once I realised how big and busy it was we soon had to re think our plans as I didn't think Simon would want to spend his birthday following me round on a bargain hunt. 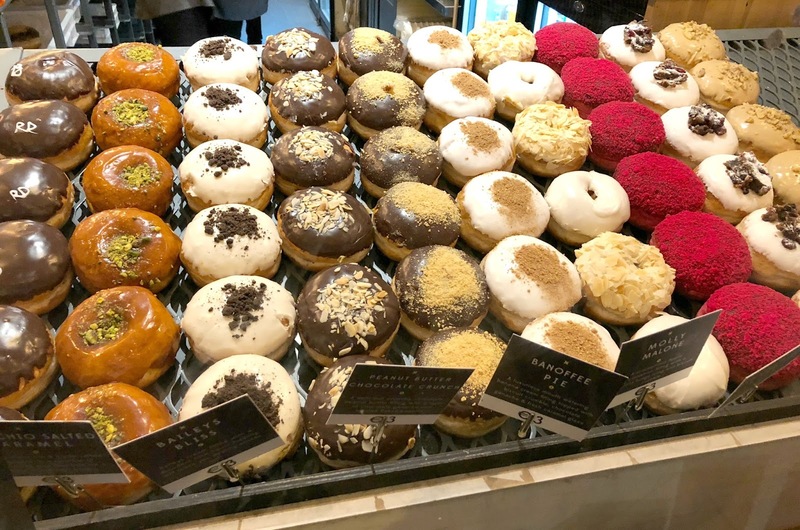 Did you know that Dublin is an absolute heaven for donut lovers? There are so many places that produce the most delicious looking treats for the donut fan and it was a real struggle stopping ourselves from trying them all! Our favourites? Aungier Danger, so popular that it's been known to have queues down the street, and The Rolling Donut! These guys have donuts nailed, some amazing flavour combinations, generous fillings, the most beautiful toppings and wow they were big. Every time we walked passed a donut shop we had to press our noses up against the glass just for a little look, I can't believe we only ended up having a couple during our visit! I pre booked a couple of things to do when we were in Dublin, the organiser in me just can't resist a bit of planning! 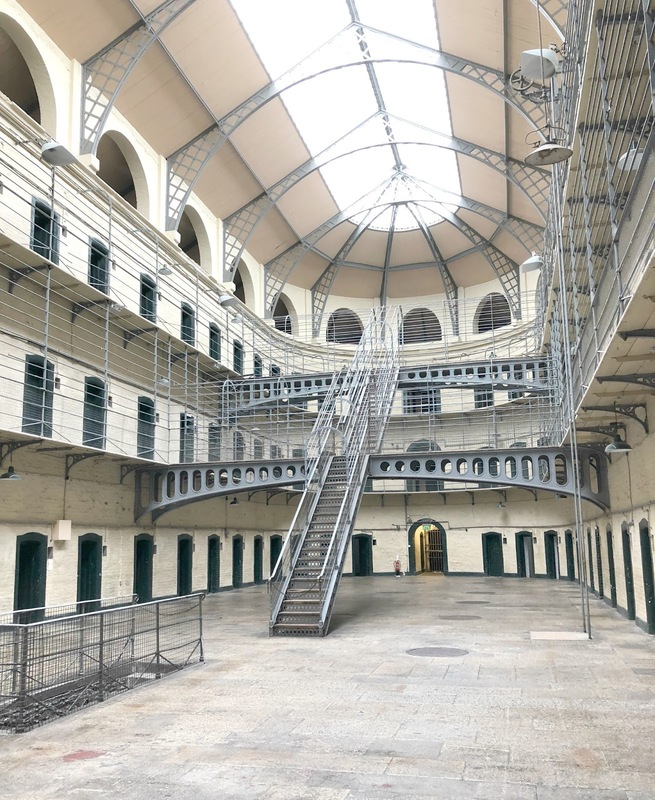 Kilmainham Gaol - An absolute nightmare to find, we almost gave up looking for the gaol when we realised we were about to miss our tour, luckily we weren't the only confused tourists wandering the streets and managed to buddy up with some others who were lost to get there just in time. I'm so glad we decided to visit the Kilmainham Gaol, the tour is fully guided which we found far better than reading from boards. Simon and I definitely aren't history buffs and are a little like children in museums, we need to be kept entertained! Our guide was so knowledgeable, had so many fascinating stories that gave me goosebumps and truly made the gaol come to life. The Guinness Storehouse - We couldn't go to Dublin without a trip to the Guinness Storehouse, the ultimate tour for the Guinness fan. The Storehouse is a self guided tour round the world's largest pint glass, seven floors full of delicious smells, interactive displays and a very interesting insight into Guinness and its importance to Dublin. 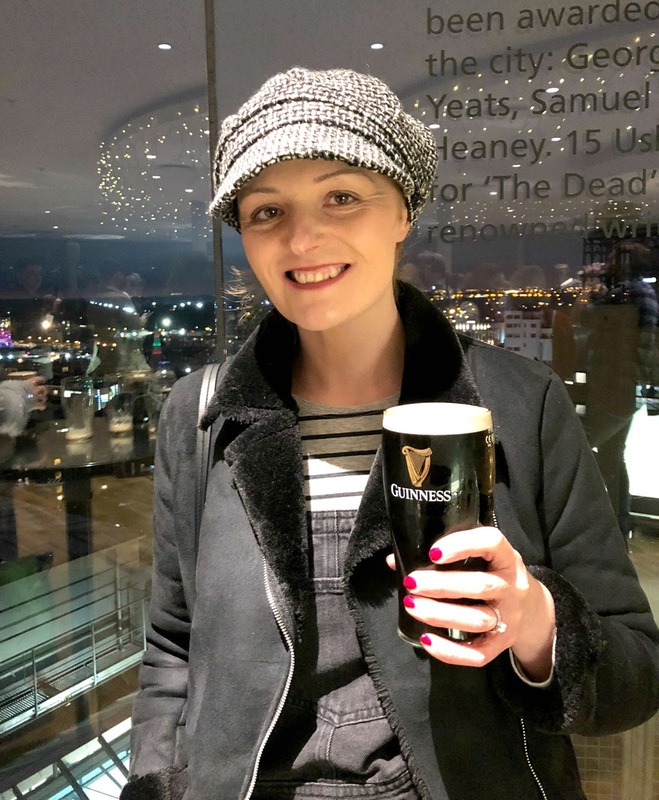 Our entry ticket included a pint of Guinness which we enjoyed in the Gravity Bar, the Storehouse rooftop bar offering great views across Dublin. Simon and I aren't party animals so I'm afraid I can't really tell you which are the best pubs to hit, the Christmas crowds kept us away from Temple Bar and so we spent our evenings enjoying delicious food and attempting to find quiet corners to drink in (very hard!). 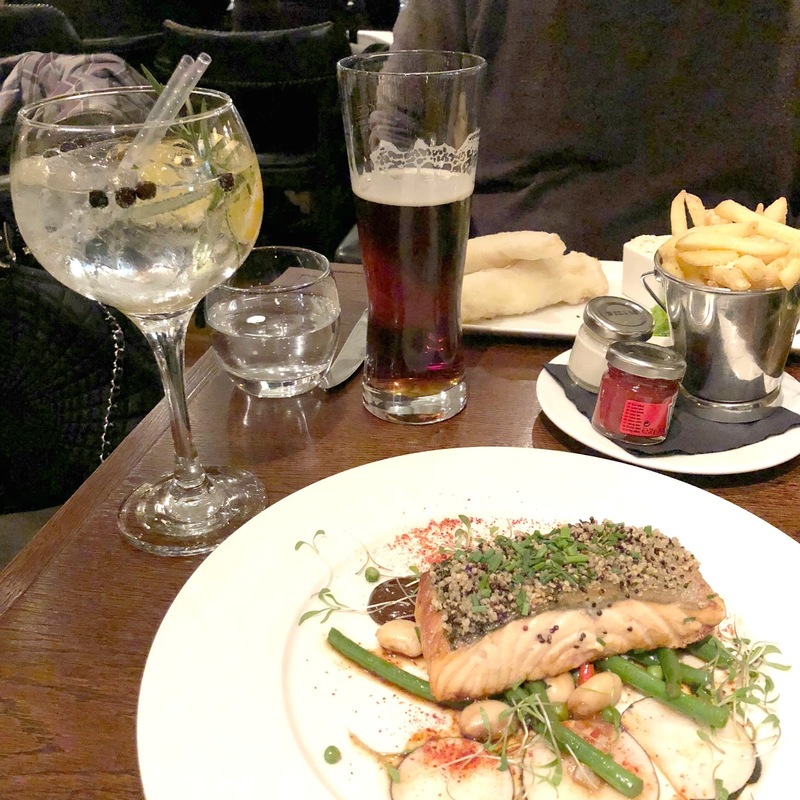 Balfes - Our first discovery was Balfes at the beautiful Westbury Hotel, I was glad I'd pre booked our table as Christmas parties had taken up a lot of the restaurant. The menu is small and ever changing with delicious seasonal dishes. I somehow managed to resist the fish and chips and went for the salmon which was perfectly prepared. 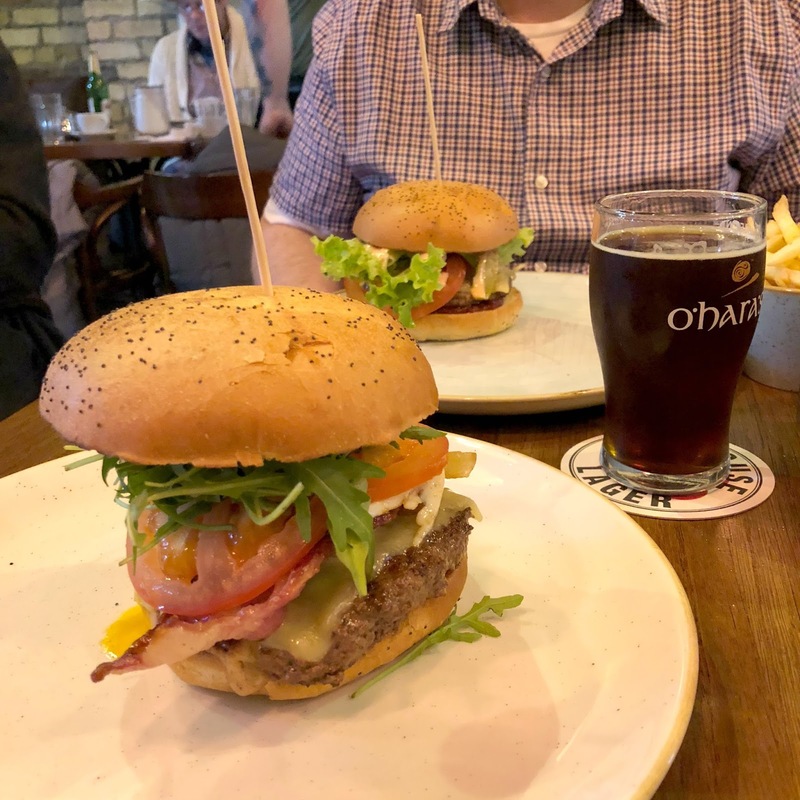 Bobos - Keeping the birthday boy happy I did a lot of research into the best burgers in Dublin before our trip and we booked a table at Bobos who have the most impressive burger menu in the city. With over 30 to choose from we were in our element studying the menu. I opted for The Humpty Dumpty which featured a fried egg, burger sauce, Old Dubliner cheese, caramelised onion and cured smoked bacon. 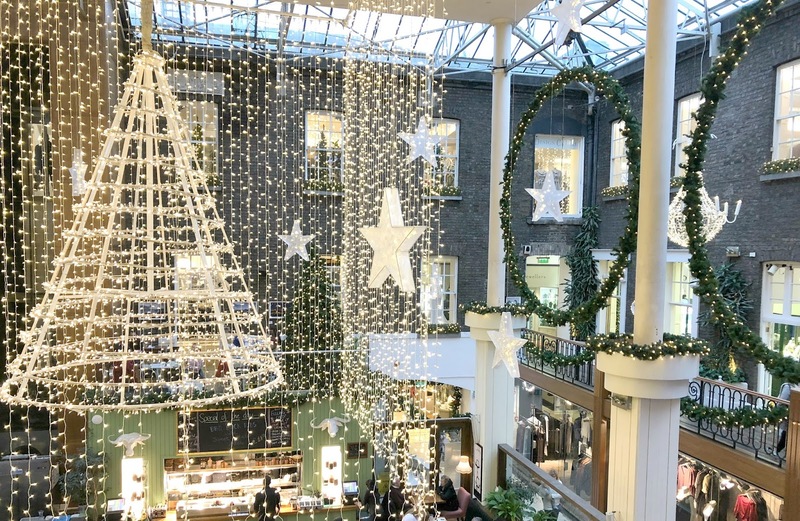 We loved our visit to Dublin and are eager to plan another visit at a quieter time of the year. Only a short flight from Newcastle and fairly cheap (as long as you don't mind putting your trust in Ryanair!) it is the perfect city break! Have you ever been to Dublin? I'd love to hear about your experiences. Hurray! I don't know how you all managed to keep a secret for that long, seriously impressive! Great post! I've never been to Dublin before, it looks lovely. I went to Belfast a few years ago and it was pretty cool but Dublin deffo needs to get on my to visit list. PS, is that red doughnut covered in freeze dried raspberries or is it just me?!?! YUM! Yeah I think it might be! 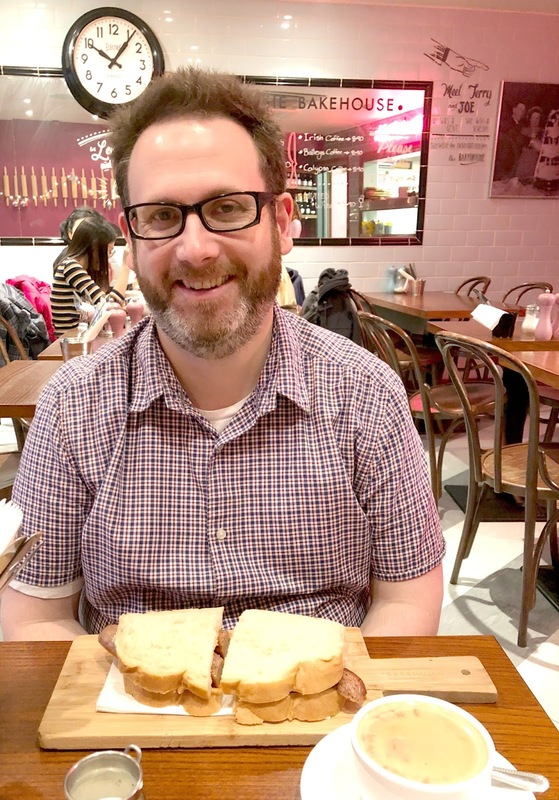 I think we tread many of the same paths when we were in Dublin last year - Simons Bakehouse sausage sandwich brought back many happy memories! I hope I get to head back soon for more of those doughnuts! OMG those doughnuts! We needed time to try more! Fab little guide to Dublin! We once booked flights when they were so cheap but in the end didn't make the trip. We will one day though! Steve has visited a couple of times on various stag dos. I'd love to find a proper Irish Pub like the bit in Titanic when they're below decks! It's definitely an easy one to do, our flights weren't that cheap because it was Christmas time but I think you can get a pretty good deal at other times. We definitely want to go back! I like the idea of French toast and maple syrup. Obviously read this at the wrong time as that burger also has me craving food. I always crave food reading my own posts back! Looks like you've had an awesome time. Cat's been asking about if we should go this summer! Food looks great and its some where I've never been to yet. Thanks for sharing. Yes you really should! It's pretty easy to organise and so easy to get to! Definitely worth a visit! Ooooh how exciting .. make sure you have some doughnuts! Argh no, what were the chances!